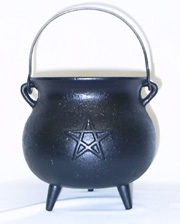 Great for your Altar, candy, condiments, herbs, gourmet, votives, tealites. Height: 4.25" Width: 3.5" Capacity: 10 oz Weight: 1.8 lbs. The storybook version with heavy metal carrying handle. Great for incense, decor, and safe for food use. Height: 6.5" Width: 6.25" Capacity: 2 qts Weight: 7 lbs.